This walkthrough describes how to add and customize methods in WCF RIA Services that query a data source. Such methods, which are referred to as query methods, must be defined with a signature that the framework recognizes as specifying a query method. The query methods satisfy this requirement by applying the QueryAttribute. The set of expected query signatures are divided into two broad categories: those queries that always return a single type of Entity and those queries that can, potentially, return more than one Entity of type T in an IEnumerable<T> or an IQueryable<T>. For more information about the permitted query method signatures, see Domain Services. When you create a new domain service class and specify their entities in the Add New Domain Service Class dialog box, the RIA Services framework automatically creates a simple query method in this class for each entity exposed by the service. This query method simply retrieves all of the records for the entity. This walkthrough describes how to add new query methods that perform more complex scenarios such as filtering by a parameter value. This walkthrough shows how to add queries that return a single entity and also how to add queries that return a collection of entities. This walkthrough assumes you have completed the procedures described in Walkthrough: Creating a RIA Services Solution and have the solution created there ready to modify in the procedures described here. Open the solution constructed in the Walkthrough: Creating a RIA Services Solution topic that exposes data from the Customer table. In the server project, open the CustomerDomainService domain service class that exposes data from the Customer table. 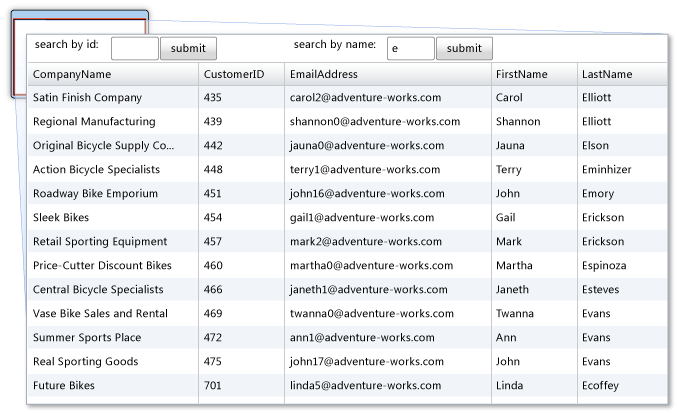 Add a query method that accepts an integer parameter and returns the Customer entity with the matching customer ID. Open the domain service class that exposes data from the Customer table. In the CustomerDomainService domain service class, add a query method that accepts a string parameter and returns any customers whose last name starts with that letter. The method can return an IQueryable<T> object because the user may want to provide additional query operation from the client. To display the results of those query methods in the client project. Add two TextBox controls and two Button controls so that the user can filter customer records either by the ID or by the first letter of the last name. Open the code-behind page for MainPage.xaml (MainPage.xaml.cs or MainPage.xaml.vb). The following illustration shows a list of customers filtered by the last name that appears when the application is run.